HAWAII ATTACKED rising gas prices with a blunt knife and came up with a solution about as clear as crude oil. Nearly five months into the state's experiment with gasoline price controls, economic studies suggest drivers aren't saving money at the pump. But some consumer advocates say the gas caps make prices more fair. Hawaii has long had the highest gas prices in the country. Although Oahu is only 44 miles long, its drivers put up with prices close to $3 a gallon, often spend hours stuck in traffic and run up annual mileage that compares with mainland motorists. The gas cap was pushed into law by Democrats in the Legislature as a last-resort solution to keep the oil companies honest and reduce prices. That hasn't happened since the law went into effect Sept. 1, according to research by University of Hawaii business economics professor Jack Suyderhoud. His data show that prices have increased about 5 cents per gallon, on average, compared with mainland prices since the gas caps started. "I don't think that by any stretch of the imagination you can say that the cap has contributed to lower prices. In fact, it has led to higher prices," Suyderhoud told the Associated Press. Former Chevron station dealer Frank Young disagrees. He said the gas cap introduced more competition and helped stop price fixing. "This market was behaving as if it were an oligarchy. Now our prices are going up and down. That was the intent of the law," said Young, who now runs an auto repair shop. A big problem with gas price controls is that it's difficult to prove whether they're working, since oil companies aren't telling what price they'd charge without them. Hawaii's gas caps, which vary from island to island and week to week, are set by averaging wholesale gasoline prices in New York, Los Angeles and the U.S. Gulf Coast. Then the Public Utilities Commission adds allowances for what it costs wholesalers to ship and distribute gas to the various islands. The caps are confusing to consumers because they don't include taxes or dealer markup, which varies widely. And there are many holes in the formula itself. Because Hawaii gets most of its gas from Asia and Alaska, critics say that tying the state's fuel to mainland prices doesn't make sense. It's also difficult to tell whether gas companies are charging as much as the cap allows, rather than what the market dictates. Oil company information about their costs and how they set prices is private, so the public has a hard time knowing if they're getting a raw deal. 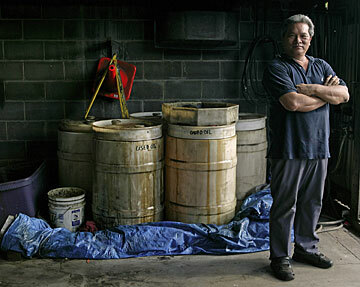 Former Chevron station dealer Frank Young stands in his garage, K & Y Auto Service in Honolulu. Young believes Hawaii's gas price control law, which was designed to prevent gouging and introduce more fairness in pricing, has led to lower prices statewide. "We passed a gas price cap law without knowing what was actually happening," said Ted Liu, director of the Department of Business, Economic Development and Tourism. "The price cap brought us from no government intervention in the markets to an absolute government intervention." The law accomplished at least one of its goals -- more competition among retail gas stations. Prices are limited only at the wholesale level, and retailers still can charge what they want. Bargain hunting is common when caps are announced. "If you drive around, you can find better prices," said Richard Miller, a member of the Citizens Against Gasoline Price Gouging and a University of Hawaii law professor. Gas price controls were introduced because of concerns that Hawaii's two oil refineries -- run by ChevronTexaco Corp. and Tesoro Corp. -- were artificially keeping prices high because they controlled the state's isolated gas market. A 1998 state lawsuit against Chevron and Texaco, before they merged, alleged they conspired with other oil companies to fix gasoline prices in Hawaii. The lawsuit was settled for $35 million in 2003. Representatives for ChevronTexaco and Tesoro both say the gas cap law is negatively affecting their businesses. The only thing that everyone agrees on is that it needs to be changed. Analysts and oil companies want it repealed, lawmakers want it easier to understand, supporters want it fine-tuned. Republican Gov. Linda Lingle, who opposed the idea but let it become law, is calling for an end to the gas price cap, replacing it with a new system that would create an estimate of what consumers would pay if imported gasoline were available. That estimate would serve as a "virtual competitor" against ChevronTexaco and Tesoro, so customers would know what they should be paying for gas. "The issue is trying to find more ways of opening up the market," said Wu Kang, a fellow at the East-West Center in Honolulu. "The price cap is clearly intervening in the free market." Democratic Rep. Marcus Oshiro said he is looking for ways to modify the law so that it is more transparent. He released a study Jan. 11 that indicates drivers have saved $33 million because of the gas cap, based on the widening difference between the cost of unleaded and diesel fuels, and excluding the jumps in prices seen after Hurricanes Katrina and Rita. "We need to do what's best by our consumers, not for the oil companies, not for the politicians," Oshiro said. "The general concept is to work out what a fair price would be." How it works: The law sets price caps by averaging wholesale gasoline prices in New York, Los Angeles and the U.S. Gulf Coast. The Public Utilities Commission then adds a 4-cent "location adjustment" and another 18 cents for the market margin. Another few cents are put on top for the cost of transporting the fuel to different islands. Wholesale prices are set every Wednesday and go into effect the following Sunday. Comparisons: Hawaii traditionally pays more for gas than any other state. In a recent AAA check, Hawaii's average cost was $2.83 per gallon, followed by New York at $2.57, Connecticut at $2.47 and California at $2.44. The least expensive gas is sold in Utah ($2.13), Wyoming ($2.16) and Oklahoma ($2.16). One view: Before the gas cap law, Hawaii paid an average of 44 cents more per gallon than in mainland states. Since the law went into effect Sept. 1, the differential has increased to about 49 cents per gallon, according to a study by University of Hawaii business economics professor Jack Suyderhoud. Another view: A study by state Rep. Marcus Oshiro, a gas cap advocate, indicates it has saved Hawaii drivers $33 million. He made his calculation by projecting how much unleaded gasoline would have cost if it had followed the same trends as diesel fuel since Sept. 1. The difference between the two types of fuel has widened in that time from 25 cents to about 70 cents.